Ajuy is a small village on the West coast of Fuerteventura, in the municipality of Pajara. Ajuy used to be an important fishing port on the island and even today people in the village still do some fishing. So if you want to try the local fish, here you will get to enjoy dishes with some of the freshest fish caught in Fuerteventura. You can get to Ajuy by following the FV-621 road, that will take you straight to the village. There is a free car park at the beach, so you can leave your car here while exploring the area. The beach in Ajuy has black volcanic sand and swimming here is no advisable, since it is very dangerous due to the constant big waves and currents. Although you shouldn't try to swim in Ajuy, the beach is a nice place to explore and to enjoy a few moments admiring the great landscape. Right off the beach you will find a few small restaurants where they serve mostly fish, caught right there on the village coast. Ajuy beach is also one of the best places to admire the sunset in Fuerteventura. Usually in the evening the beach is quiet and there are very few tourists, compared to some other moments during the day. In 1994 Ajuy was declared a Natural Monument and is included in the Betancuria Rural Park, situated in the municipality of Pajara. The place was declared a natural monument because of its paleontological and geological significance. Scientists found here some of the oldest materials in the Canary Islands, such as marine fossils, consolidated dunes and oceanic sediments observable on the surface. From Puerto de la Pena the locals used to ship out lime and syenite rocks to the other islands. In Gran Canaria for example,cobblestones made from the syenite rocks and some are still found on the streets in La Palma de Gran Canaria. In order to get to the caves of Ajuy you will have to head to the north of the beach and follow the marked road. It will take you to a few viewing points, where you will get to admire the ocean from up high and then you can continue your journey towards the 2 caves that can be visited. The 2 caves are interconnected. 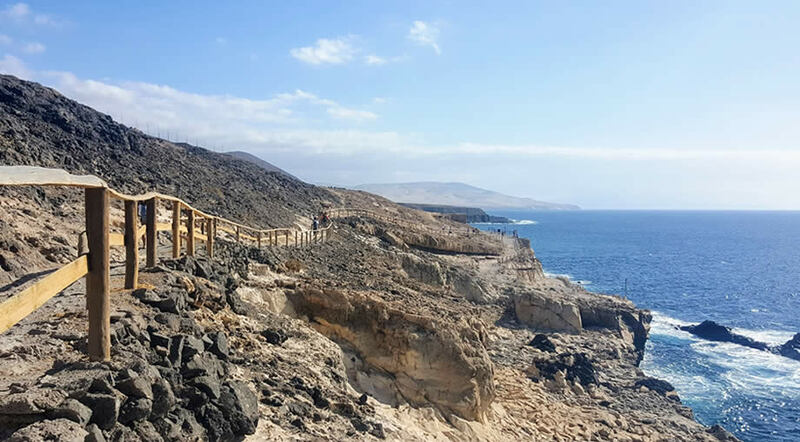 Many tourists come to the village just to see the caves, called Cuevas de Ajuy in Spanish, which were formed in the volcanic cliffs due to the wind and sea erosion during a period of many years. The caves are accessible to visitors through a stone staircase, but you should proceed with precaution, since the steps are often very slippery. Make sure you are wearing adequate shoes, not sandals or flip flops. Monumento Natural de Ajuy is part of the Rural Park of Betancuria and it really is a place you should visit during you stay in Fuerteventura. Here you will see the force of the ocean and the wild side of the island, with landscapes typical only to the west coast. 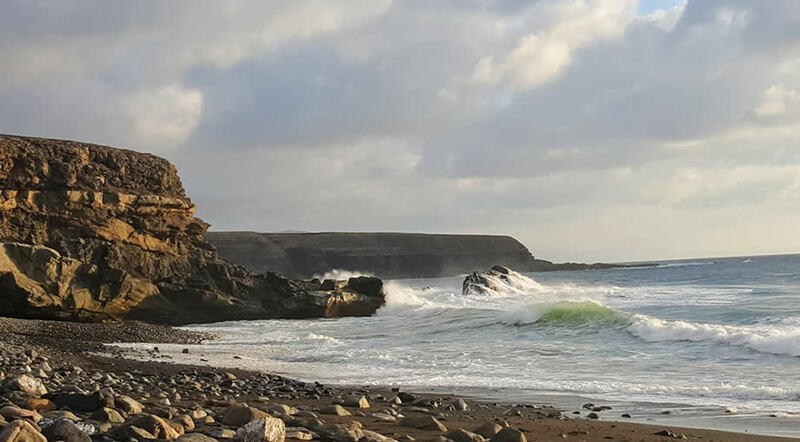 Another similar small fishermen village we recommend you to visit is Puertito de los Molinos, on the same coast, just a little further north, towards El Cotillo.